Soak white beans in cold water overnight, then drain. Heat up a pot with slightly salted water. Add beans and cook on medium heat for approx. 50 – 60 min., or until beans are softened and start to burst. Set aside. Peel potatoes and cut into quarters. Cook in salted water on medium-high heat for approx. 20 – 25 min. until softened. Drain and mash with a potato ricer. Set aside. While potatoes boil, prepare wild garlic pesto. Toast pine nuts in a clean frying pan on medium-high heat for approx. 2 – 3 min. Add sunflower oil, pine nuts, and Parmesan to food processor and blend to combine. Chop wild garlic and add to food processor. Blend until a soft mixture is formed. If desired, add more sunflower oil until pesto is creamy. Season with salt and pepper. Set aside. Remove tomato stem and slice crosswise on the opposite side with a knife. Trim ends of Kenya green beans and flat beans. Next, cut beans into bite-sized pieces. In a large saucepan, bring water to a simmer and add salt. Blanch tomatoes for approx. 3 – 5 sec. Transfer to an ice bath immediately after, then drain. Repeat this step with both beans, blanching each for approx. 2 – 3 min. Afterward, drain through a sieve and transfer to ice bath. Set aside. Peel tomatoes and cut into quarters. Remove core and dice. Peel and finely dice shallot. Finely dice chorizo. Remove half of thyme leaves from sprigs and chop. Preheat oven to 180°C/355°F. Trim rack of lamb, making sure to remove any silver skin and unnecessary fat, so that bones are cleaned. Lightly season with salt and pepper. 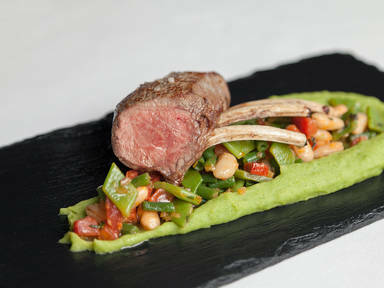 Heat sunflower oil in a frying pan on medium-high heat and sear rack of lamb from all sides for approx. 1 min. each. Transfer to oven rack and bake in oven for approx. 10 – 12 min. Remove from oven and let rest. For the cassoulet, fry shallots and chorizo dices in a frying pan on medium heat. Drain white beans. Add blanched flat and Kenya green beans to pan and heat for approx. 2 min. Add tomatoes and chopped thyme and season with butter, salt, and pepper. Finally add white beans and keep simmering on low heat to keep cassoulet warm. For mashed potatoes, heat milk and some of the butter in a small saucepan. Season with nutmeg and salt. Add milk mixture little by little to potatoes until creamy. Stir in wild garlic pesto and keep warm on low heat. Prepare infused butter right before serving. To do so, melt butter in a small saucepan on medium heat. Add crushed garlic and remaining thyme. Coat racks of lamb in it just before serving. Arrange mashed wild garlic potatoes on a serving plate. Top with cassoulet. Slice lamb and place on top. Drizzle infused butter over everything. Enjoy!